With SWTOR rapidly approaching its fifth birthday at the end of the year, I'm thinking that the game's old enough now for us to start waxing nostalgic about how much better things used to be "back in the day" - or how they were different at least. I don't think that SWTOR has undergone nearly as many changes as for example World of Warcraft did in its first five years, but things have changed nevertheless. In light of this I wanted to start a series of posts detailing some of these changes - both to indulge in nostalgia and to let newer players know how much better they've got it these days (or what they missed out on in some cases). For starters I'd like to cover the subject of travel, which is one of those areas that has definitely seen a lot of changes. Free players may feel like second class citizens these days for not getting Sprint at level 1, but back in the day none of us did, and the starter planets are all small enough that they were clearly designed with the intent to be easily traversable even at slow speeds. Sprint wasn't unlocked until level 14. Yes, this meant that you could enter a PvP warzone without it - I remember doing that once and then never again, after how horrified I was by how slow I was at getting to the side turret in Alderaan Civil War. In case you've ever wondered why this blog doesn't have a "mounts" tag but only a "vehicles" one, this is because at the game's launch vehicles were the only mounts we had. 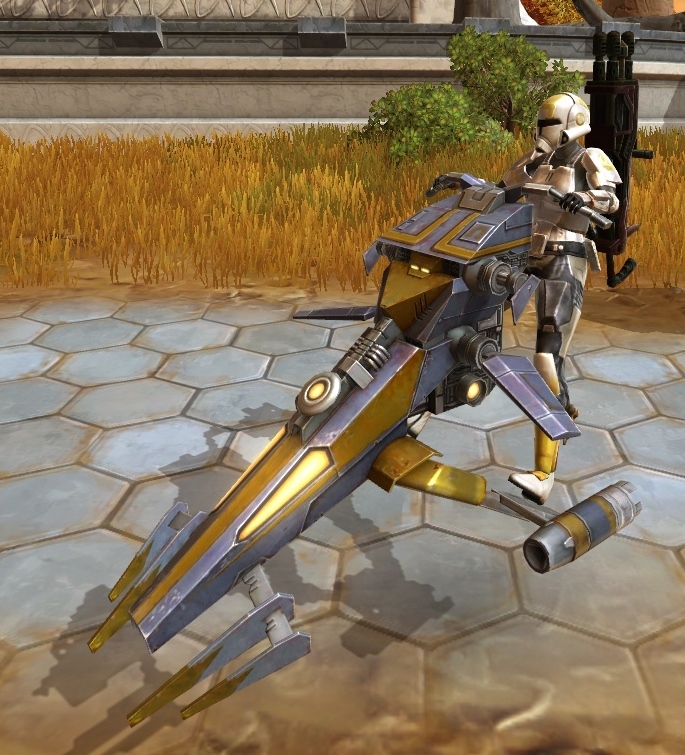 The first animal mount wasn't introduced until patch 2.3, when rideable tauntauns were added to the game. Use of those early speeders was also a lot more restricted than it is now. If it still annoys you that you get dismounted in the Senate Tower on Coruscant, just think of what it was like when this happened in every single spaceport and space station, and that at a time when people had to walk/drive back to their ships all the time. You also couldn't train the first rank of speeder piloting until level 25. Again, this is still quite apparent from the way the planets were designed, as Coruscant/Dromund Kaas, Taris and Nar Shaddaa aren't that big compared to some of the later planets. I remember being really relieved to get a speeder by Tatooine, as that's when things really opened up. 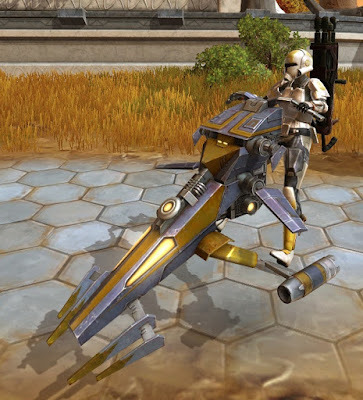 Speeder rank was initially also tied to the vehicle itself, so once you upgraded your skill, you needed to buy a new one that was actually faster. I remember doing quite a bit of research about that before I settled on my Ubrikkian Raider back in the day. The downside was of course that once you were capable of travelling faster and more securely, you never wanted to ride the older and slower vehicles again. It wasn't that long ago that we had to discover each taxi point first before we could travel to it (except for Makeb), but with 3.2 this requirement was removed, which in a sort of interesting turnaround has made travelling around a new planet by taxi the fastest way of helping with its discovery. Initially, some taxis also weren't fully linked up - Dromund Kaas was infamous for this, always forcing you to leg it between the taxi pad at the Kaas City entrance and the one inside the city if you wanted to cross the entire map. The teleporters on Belsavis also weren't all linked up the way they are now. 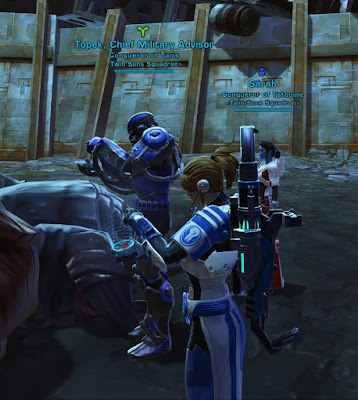 I remember when I first started playing SWTOR, I was hugely impressed by the quick travel feature - and that was when it had a half hour cooldown! This was because I was coming from WoW, where you can only set your hearthstone to one location at a time (though I think they've added extra options since my time). In comparison, SWTOR's ability to choose to quick travel to any point on the planet once you had discovered it was absolutely amazing. In addition to that you also got the fleet pass once you hit level ten, which allowed you to return to the fleet once per day (!). In terms of questing dynamics this meant that you generally used the quick travel option to "get back to base" after finishing one area of the map (though it might not always be off cooldown) and the fleet pass was reserved for the end of the evening when you were done with everything else. A lot has changed since then: if you're a subscriber and have all the legacy perks unlocked, neither quick travel nor the fleet pass have any sort of cooldown on them, but even without those perks the cooldowns are much shorter than they used to be. On planets this means that once you've discovered a part of the map, you can hop from any quick travel point on it to another, at no cost and with no cooldowns, making taxis completely redundant unless you've only just landed on the planet for the first time. (I don't remember the last time I used one of the taxis on the fleet...) Likewise there's nothing stopping you from using your fleet pass for absolutely everything on the fleet, even if you already are on the fleet and just want to get back to the centre of the main station quickly. Another important change to quick travel points is that nowadays they simply unlock by proximity. It used to be that you had to click on each one to unlock it, which led to many a "d'oh" moment when you were in the middle of hostile territory, wanted to return to base quickly and realised that you'd forgotten to manually unlock the nearest outpost's quick travel point on this character. Some were also notoriously bugged and would constantly reset themselves back to being "forgotten" - the one in front of the Dread Fortress on Oricon was a well-known offender, as was the Raider's Cove cantina on Rishi. Outside of the means of travel mentioned above, travel between planets originally meant using your ship - the one method of travel that hasn't really changed much since launch and one that's very slow and inconvenient. If you were on the fleet and wanted to do dailies on Belsavis for example, you'd have to run/drive to the correct hangar for your class, board your ship, use the galaxy map to travel to Belsavis, exit on the Belsavis space station and then travel down to the planet every time. Terminals were Bioware's first attempt at alleviating this issue a bit by placing terminals at key locations that would instantly allow you to travel to your ship or to prominent daily locations with a single click. I remember it originally being such a hassle to always remember the way to the correct hangar for whatever class you were on at the time, but with the terminals placed at every hangar entrance this became a non-issue as every terminal would simply allow you to choose "your ship". Doing the rounds around the different daily planets also became a lot easier once you didn't have to board and disembark from your ship anymore between each planet. Over time, Bioware introduced more and more ways to quickly get from point A to point B. It started with additional legacy travel unlocks that would function like the quick travel or fleet pass option and quickly take you to various places that required visiting more frequently, such as your faction's capital world or a planet with dailies. However, the ultimate in travel convenience was introduced with the strongholds expansion - I even dedicated a whole post to this. Strongholds allowed you to travel to your stronghold instantly and from anywhere - and afterwards you could chose the option to be returned to exactly where you had come from (unless you logged out in the meantime - then it will take you back to the same planet but dump you at the spaceport/entrance). This means that you never again had to worry about things like running out of bag space in the wilderness or unexpectedly needing something from your cargo hold - your stronghold could be modified to contain all these services and was only a click away. Guild ships also finally introduced the option to "summon" other people to your location as it's usually called in fantasy games - finally allowing everyone to slack off when you needed a large group of people to move to a specific location and alleviating everyone else's annoyance with that one guy who was always the last to make his way over. People quickly discovered the usefulness of this feature to get people to difficult to reach datacrons en masse - however I believe that at least the ability to do this with the fleet datacron was later patched out; I'm not sure about others. Travel is one of the areas in which the game has changed the most in my opinion, since it's become a lot more convenient over the years than it used to be. Originally you always had to use your starship to travel everywhere, but nowadays you pretty much only do this for the base levelling game, with endgame being dominated by using terminals and quick travel options to get around. I remember in World of Warcraft I always felt that the increasing ease of travel (flying etc.) diminished my feeling of being inside a virtual world a lot, but curiously I never really had this feeling in SWTOR. I think the reason is that the stuff we skip in a game like WoW are zones that we actually used to play in and that we don't really perceive anymore when we fly over them, while the space between planets in SWTOR has always been irrelevant to the experience. I suppose I feel somewhat less of a connection to my ship now since I don't board it as often, but to be honest I never felt very attached to it anyway, and since the stronghold expansion my strongholds have always felt much more like a home to me than the ships ever did. I still remember doing the entirety of Republic Tatooine without a speeder back in the day (long story short; my character was just that bad at Credit management), which is something I don't think even I - with my preference for traversing the landscapes with nothing but personal vehicles as opposed to Quick Travel - could bear to do again while questing. I did recently do a walking tour of Alderaan, though. That was nice to do without needing to rush from point A to point B. My original main was so broke after buying a speeder he couldn't afford to buy skill upgrades! That was a real "old school MMO" moment at the time. I still don't have most of the mentioned legacy perks unlocked so I guess I tend to use my characters ships a lot more. Quick travel in SWTOR is both more convenient and less advanced than the equivalent in other MMOs. You can quick travel for free a lot more often than most MMOs, but not being able to quick travel to your choice of planet could (and still can) be a bit of a jarring moment. However, compared to MMOs like LOTRO and Wildstar that allow you to fast travel to almost any location. Although it's time-consuming having to use the old ship to fly between planets, I still love the little hyperspace jump animation and I will never grow tired of that. I don't know how I'd feel about being able to hop between planets completely without restriction. I do think having to slow down just a little there helps a bit... not exactly with immersion, but with sense of scale. We're already traversing entire planets in an instant; a galaxy is an even bigger place though. I'd argue that another aspect of the ease of travel in SWTOR is that it is a SF game (or Science Fantasy game, given the nature of the Force), so the prospect of instant travel seems more likely. In fantasy worlds such as LOTRO or WoW or Age of Conan, not so much. You have to assume a certain level of magical commonality that most Fantasy worlds simply don't have. Take WoW for instance; sure there's magic all over the place (and teampunk-esque tech more as an in-joke than anything else) but instant travel outside of a Mage's porting ability doesn't exist. * And Middle-earth was very much a "low magic" world as Tolkien envisioned it in the Third Age, and even the Elder Days didn't have magic to the point of having teleportation or flight (with rare exceptions), both of which are common abilities in any mid-high level D&D game. But in an SF game the prospect of instant travel makes sense. Technology allows a player to move around in ways that hoofing it on foot or by mount simply can't match. That said, I still travel on foot in SWTOR a lot, mainly to hear the little quips by companions when we hit a new area. *Blizz did make players re-learn all of the flightpaths in Mists after dropping it for Cataclysm, but I don't know if they returned to the Cata method for Warlords or Legion. I understand that argument in theory, I don't think it applies in practice though, because lore-wise, Star Wars doesn't generally have instant teleportation either (the teleporters on Belsavis are a clear exception) and quick travel is implied to happen via a shuttle picking you up. With the way many fantasy games have copied WoW's way of summoning mounts out of nowhere, there's no reason you couldn't have a quick travel option where a mount appears, the view fades to black, and then you instantly reappear at your destination. True, but the way the quick travel is implemented in a fantasy game implies teleportation. Look at WoW's heartstone or LOTRO's milestones, and how they're implemented graphically. I would prefer to have a version of this that mimics the "swift travel" option that LOTRO has, where a mount is summoned, you take off and then fade to black, only to reappear at the correct endpoint. You can miss some non-story givers by not travelling as the original design contemplated. That's true (just the other day I visited that old lady still hiding at the foot a mountain on Alderaan), but they also moved others around to make sure you will see them even if you don't travel along the road the first time and take a taxi instead. It came to mind because I just realized I missed doing that one quest on DK where you have to go defeat 12 or so of those stealth spy aliens for some paranoid idiot while I was there with my DvL Sorc. Also, while they moved the Revanite quest giver on DK, the way they did it breaks the flow of travel such that I always end up clearing out the rest of the Gratham's Estate missions, going up to the Revanite sanctuary, playing their reindeer games, and then cussing because I realize I have to go BACK into the Estate to get the [FNORD]. Hah yeah, that exact same thing happened to me on my DvL Merc. I remember having a guild "summoning party" to get that one really pesky Makeb datacron for all our alts. I did it once properly on my main first, and would have felt like a cheater if I hadn't, but there was no way I was doing it with twelve characters. I almost regret the decision to make datacrons account-wide. Datacron runs (especially the fleet ones) were quite regular social affairs in my guild. I don't suppose we'll ever do them again.